Miami Trace senior Tori Riley chips onto the No. 7 green at the Club at Quail Run during an SCOL match against McClain Thursday, Aug. 11, 2016. 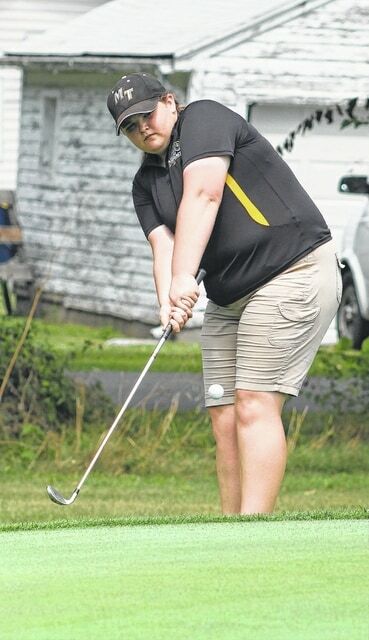 On a very hot Thursday, Aug. 11, the Miami Trace girls golf team hosted the Lady Tigers of McClain High School for an SCOL match at the Club at Quail Run. McClain won the event, 223 to 251. McClain’s Veronica Olaker was medalist with a 49. Shelbie Rowan led Miami Trace with a 59. Also for Miami Trace: Makayla Eggleton shot a 62; Morgan Eggleton and Macey Stires both shot 65; Tori Riley had a score of 70 and Lindsey Worley had a 73. Other scores for McClain: Bryn Karnes, 53; Chantel Landrum, 60; Elissa Grate, 61; Cassidy Willis, 63 and Kendal Pollard, 65. Miami Trace is now 1-2 on the season. The Lady Panthers will host East Clinton on Wednesday, Aug. 24 at 4:30 p.m.
Miami Trace’s match at home with Hillsboro on Sept. 7 has been moved to Sept. 21, according to coach Chris Miller. https://www.recordherald.com/wp-content/uploads/sites/27/2016/08/web1_Tori-Riley-MT-girls-golf-2016.jpgMiami Trace senior Tori Riley chips onto the No. 7 green at the Club at Quail Run during an SCOL match against McClain Thursday, Aug. 11, 2016.